Many of you may be making final holiday present preparations, so we thought an update to the status of the Nexus lineup in the Google Play was in store. If you were planning to pickup a Nexus 4 8GB, Nexus 7 16GB, or Nexus 10 32GB, you should probably consider other options. The 8GB version of the Nexus 4 has been sold out for at least a week, the 16GB version of the Nexus 7 joined it this week, and the 32GB version of the Nexus 10 flipped to “Sold Out” this morning. In the past, we have seen the shipping estimate extended for devices rather than a dead-end “Sold Out,” so they really must be struggling to keep up with demand. 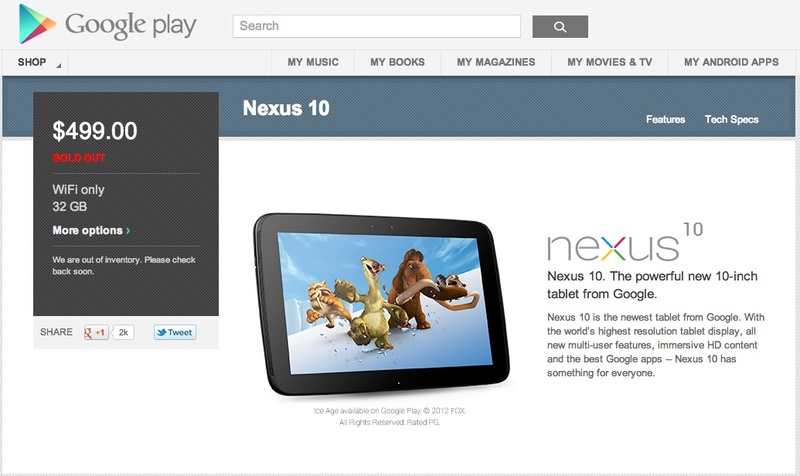 Update 12/13: The 32GB Nexus 10 is now showing as in stock and shipping in less than a week. Also, the 16GB version of the Nexus 4 is now shipping in 6-7 weeks, however, a number of folks are reporting much quicker shipping times. I for one received mine in about 3 weeks after having been told it would take 4-5. The 16GB Nexus 10 and two other Nexus 7 options are all at 3-5 business days, so they are still in play. JBQ on Pulled Nexus 4 Factory Images: "I Can't Comment on That"
Google Search Receives Minor Update, Changelog Currently M.I.A.